Is the way the Van Breda case was handled evidence of racial bias in South Africa’s justice system? Some Twitter users think so. Reacting to the postponement of the convicted axe murderer’s sentencing as well as the fact that he has been kept in the hospital section of Pollsmoor prison, a significant number of people on Twitter have claimed that Van Breda’s race has led to him being treated more leniently than he would be if he were black. This is not the first high-profile murder case in which race has been mentioned as a factor. In 2016, Ranjeni Munusamy called Oscar Pistorius’s six-year prison sentence “an homage to celebrity and white privilege”. The judge is clearly biased!! There was absolutely no need for another postponent. The defence is hopeless as well because they were defending the indefensible.#VanBreda will probably get a slap on the wrist and tablets to drink for his "mental condition". I wonder if this judge was going to be willing to be give out mercy like this if this #VanBreda boy was black. He's literally forcing the lawyers to say something to him for him to feel better about giving mercy. Send that demented fuckface to pollmorr for life! At the Cape Town High Court on Tuesday, Van Breda’s lawyers did not try to argue for a lenient sentence for their client. 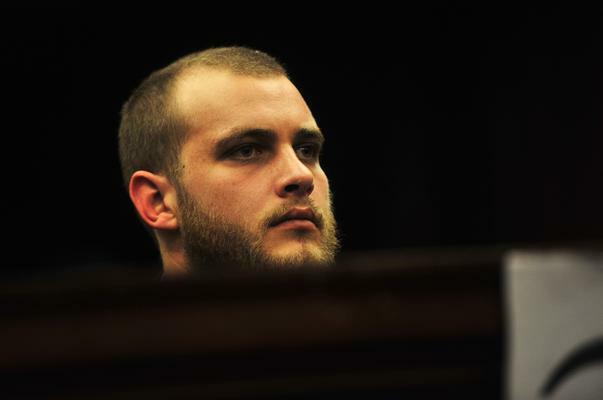 Advocate Piet Botha said he could not argue for a lighter sentence than the minimum of life in prison because that would mean Van Breda admitting to having committed the crimes. According to Botha‚ presenting heads of argument in the sentencing procedure‚ the accused “has maintained his innocence throughout”‚ and, according to a report by a social worker, is emotionally distressed by the loss of his family and thus cannot express remorse for a crime he says he did not commit. “My client shows no remorse because he maintains his innocence, and I cannot take it further than that‚” he added. Judge Siraj Desai postponed the sentencing of Van Breda until Thursday, saying he needed several days to consider his sentence.